I don't mind at all that my blog is a sweet ode' to the brilliance, black, and beautiful that our first family is! Last night our President Barack Obama took the same stage his wife held down just a day before him. After a small intro from a supporter whose son died in service, and a tear jerking video that put all of his real work into perspective, President Obama and all of his swag stepped onto the stage. There has been so much craziness surrounding these conventions. One thing I am proud of is the poise and optimism being served up at the #DNC. Last night Obama reminded us why we voted for him as President twice, and why (as you can hear in the video) many of us are sad we can't get four more years! Of course his speech was the talk of the Internets as was his wife's, and of course she too had to get in on the convo about "her Man!" President Obama made sure to have a few standout moments in this speech. He was assertive in making it clear that no one else is as worthy of this Presidency as Hilary Clinton, and making sure we understood that she is capable of making the hard decisions for the people. He pushed through with some Presidential type shade at Trump's track record as a business man. He also reminded us to get out of our feelings and into action. The quote, "Don't boo..Vote!" was a favorite on social media. It was an impromptu response from the Pres to the booing that erupted after hearing Trump's name. 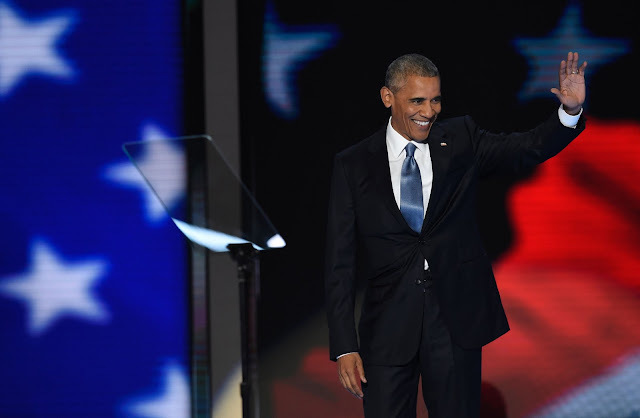 The speech really was everything we have come to love about President Obama's oratory skills. It was only bitter sweet this time, as these platforms for our beloved President are slowly ending. To have been a part of this Presidency is iconic to me! What an amazing time to be alive! Thank you Obamas! Watch his full speech below!